Beatty Legal are leaders in environmental, planning and valuation law. We were asked to take a modern perspective on their brand, while maintaining an established high-end feel. A successful law firm based on Macquarie Street in Sydney, Beatty Legal has a team 10 lawyers and growing, and are leaders in environmental, planning and valuation law. Our brand design studio was briefed to create a new modern yet conservative brand for the firm, one which is targeted to an older professional audience. We answered the brief with a memorable logotype and icon, which successfully balances a modern look while maintaining a sense of trust and stability. The use of copper and dark navy blue colours help achieve a sophisticated yet corporate aesthetic. The project included high-end embellishments across all stationery elements, including custom notebooks. We also developed marketing material and a custom responsive website, which our web design team created in-studio. 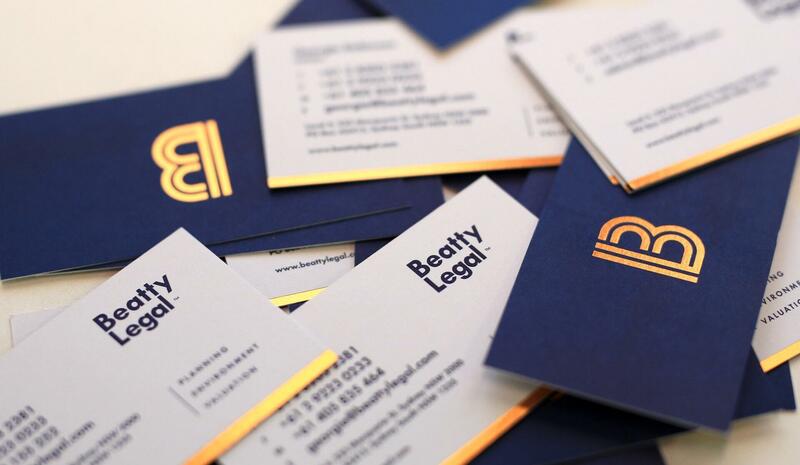 The resulting brand identity and new website shows Beatty legal as a reputable, forward thinking law firm, that achieves results for its clients.